IT’S TAKEN A LONG, LONG TIME but today the Charity Commission has at last issued its assessment of the Brewer brothers’ gross mishandling of the former SPCK Bookshops. The interim manager concluded that the trustees had mismanaged the trust. There were unmanaged conflicts of interest and loyalty related to directorships of associated companies and contracts entered into by some of the trustees. The inquiry considered that some conflicts were so intrinsically linked to the trust’s administration that they could not be managed. The inquiry was concerned that the trustees’ lack of ability to manage conflicts of interest and loyalty arising from their involvement in connected organisations could lead them to consider it appropriate to use the trust’s funds to satisfy the liabilities of the other entities. The inquiry highlighted poor governance, lack of due diligence and inadequate record keeping on the part of the trust trustees and the company directors. Trustees are under a duty to be prudent with the charity’s assets, the lack of prudence in this case and the lack of trustee awareness of their responsibilities has led to the demise of the trust and the company. The interim manager concluded that it would be expensive and risky for the trust to restart managing the shops. There was no prospect of new trustees wishing to manage the trust and no evidence that beneficiaries or interested parties wished the trust to continue. It was in the trust’s best interest for it to be wound up with surplus assets transferred to charities with similar objectives. The inquiry concluded that there had been serious mismanagement and misconduct of the trust and company by the trustees. Trust assets of £3,226,100 were safeguarded by the appointment of the interim manager and claims of £4,171,710 were managed. £1,928,853 was disbursed in settlement of claims and £144,486 was disbursed to Orthodox communities. The very long legal struggle with the Saint Stephen the Great Charitable Trust (SSGCT) has finally been concluded with a settlement involving the value of the remaining shop freeholds, which were already in the process of being sold or prepared for sale. This represented over a million pounds, which has strengthened our overall financial position and is helping us to support the Designated Fund dedicated to paying into the pension scheme that was operating in the days of the shops. We are very glad to have brought this difficult matter to a conclusion at last. It has been painful for everybody, and particularly for the staff of our former shops. The settlement is good news for SPCK and good news for the church. We reached a resolution with Saints Stephen the Great Charitable Trust and the million pounds recovered will help to strengthen the pension fund to the benefit of our former bookshop staff who were in the scheme. The valuable service which the SPCK shops gave to the Church and to their communities over many years was acknowledged with a vote of thanks and appreciation to all those who had been part of this ministry. In particular, SPCK is committed to paying substantial sums into the fund relating to the pension which was operating in the days of the shops. Congratulations must be made to Simon in particular for his quiet determination and persistence in pursuing this matter to a conclusion. The damage done by the Brewer brothers can never be undone but most of those who suffered at their hands should now be able to begin to look forward to a brighter future and, hopefully, some measure of restitution. SPCK is pleased to announce that it has finally concluded its long legal dispute with Saint Stephen the Great Charitable Trust. Simon Kingston, CEO and General Secretary, says: “We are very glad to have brought this difficult matter to a conclusion at last. It has been painful for everybody, and particularly for the staff of our former shops. We therefore welcome the news that SSGCT is unlikely to continue as a charity. As part of the agreement, SPCK receives a predicated settlement involving the return of some shop freeholds or their realised value. This will be reflected in SPCK’s annual accounts. However, we anticipate substantial disbursements – as yet unquantified – and legal costs which will be clarified in the coming months. The Rt Revd John Pritchard, Bishop of Oxford, Chair of SPCK, also welcomed the announcement. “This is good news for SPCK and good news for the Church. Now that this is resolved, SPCK can look to the future with confidence. PHILIP BREWER has filed for Chapter 7 Bankruptcy in California, Case No. 9:11-bk-14384-PC. 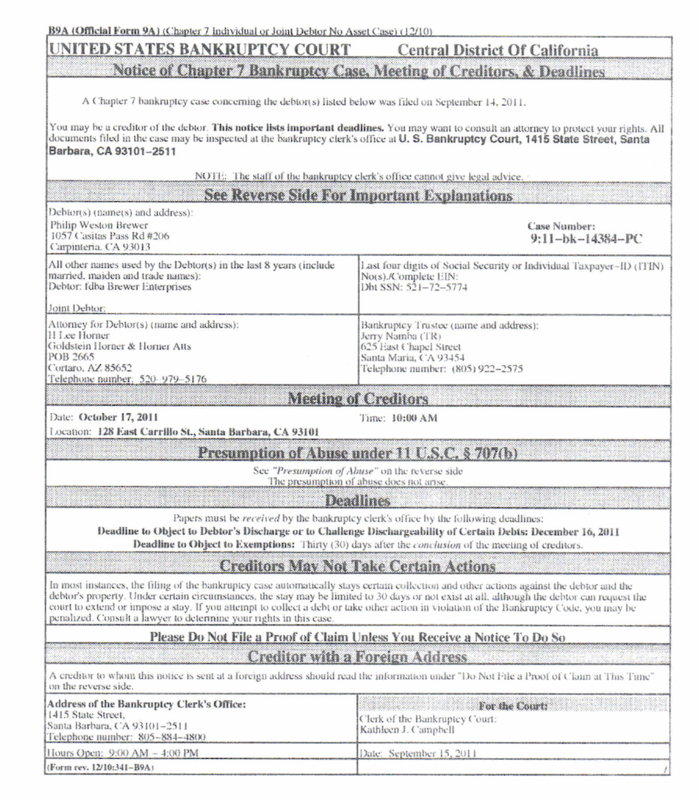 The Bankruptcy Notice states that a Meeting of Creditors is scheduled to take place at 10am, Oct 17, 2011, at 128 East Carillo St, Santa Barbara, CA 93101. The deadline given for filing objections to Debtor’s Discharge or to Challenge Dischargeability of Certain Debts is Dec 16, 2011; and the deadline to Object to Exemptions is thirty days after the conclusion of the meeting of creditors. The reverse of the notice provides important explanations including advice to creditors with foreign (ie non-USA) addresses, who should consult a lawyer familiar with United States bankruptcy law if they have any queries about their rights in this case. It also gives other important information about certain actions that creditors are prohibited from taking, such as contacting the debtor to demand payment or taking action to collect money/obtain property. Disclaimer: This post is for information only and does not constitute any form of legal advice. That’s no bad thing and I’m not for one moment suggesting that it is: improving access to the shop is good news, especially if it means that disabled people don’t have to take that longwinded route to get there. Bravo, those planners! Nor am I suggesting that there are plans afoot to close the shop, although one little bird (not a member of your staff, please note, O Most Venerable Dean, should you happen to read this) tells me that there are plans to reduce the size of the shop, which might well impact upon staffing requirements — and that, given all the uncertainty and door-slamming that the shop staff have faced over the past few years, is most definitely not good news for anyone. The Durham Cathedral Shop stocks a range of guide books, gifts and souvenirs, as well as a selection of religious and theological books. The Cathedral Book and Gift Shop: Books sidelined? And what of the staff? Where does this leave them after the years of abuse and neglect? 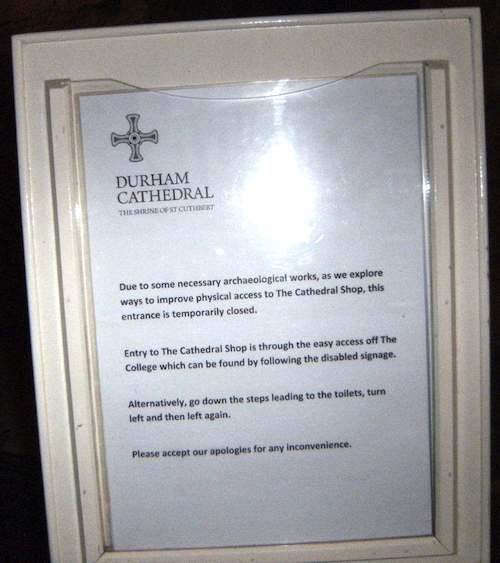 In today’s world no job is secure, of course, but one would hope that having at last secured the shop for the Cathedral’s own use, the Cathedral authorities would set out to support, reassure and — dare I suggest such a radical idea? — perhaps even reward the staff for their loyalty and commitment to the Cathedral. Because that is assuredly what has kept them there: personal dedication to the cause. Durham Cathedral Shop staff: I salute you! May those who have been entrusted with power to open and close doors before you always do so with the fairness, integrity and respect that becomes a renowned Christian institution; may charlatans such as the Brewers never darken your doorways again; and when your closed door reopens, may it open the way to good things and happier times for all. About 3 million people visit the Taj Mahal every year. This blog was viewed about 34,000 times in 2010. If it were the Taj Mahal, it would take about 4 days for that many people to see it. In 2010, there were 17 new posts, growing the total archive of this blog to 278 posts. There were 17 pictures uploaded, taking up a total of 4mb. That’s about a picture per month. The busiest day of the year was January 22nd with 418 views. The most popular post that day was Removals Fairies Strike at former SPCK Bookshop, Chester. 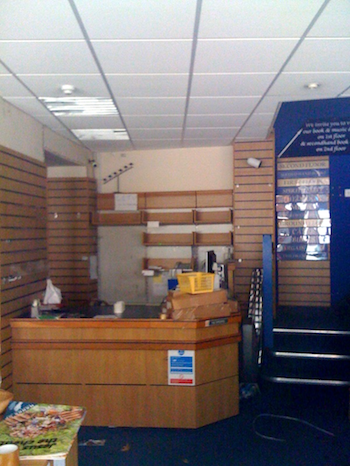 The top referring sites in 2010 were christianbookshops.org.uk, christianbookshopsblog.org.uk, facebook.com, mattwardman.com, and twitter.com. Some visitors came searching, mostly for proposal to strike off, spck ssg, spck, active – proposal to strike off, and gemstar exeter. Phil Groom on Welcome to Worcester? Mark Brewer: Is This You? All opinions expressed are those of the individual contributors concerned and should not be taken as representing the views of any particular group or organisation unless otherwise stated. All comments should comply with the standards set out in the Christian Bookshops blog Comments Policy. Failure to abide by those guidelines may lead to comments being deleted without notice. Thank you. In submitting any communications to this website or its representatives by any means whatsoever you grant an unrestricted worldwide license to cite, republish or reuse all such communications in part or in whole via any medium. 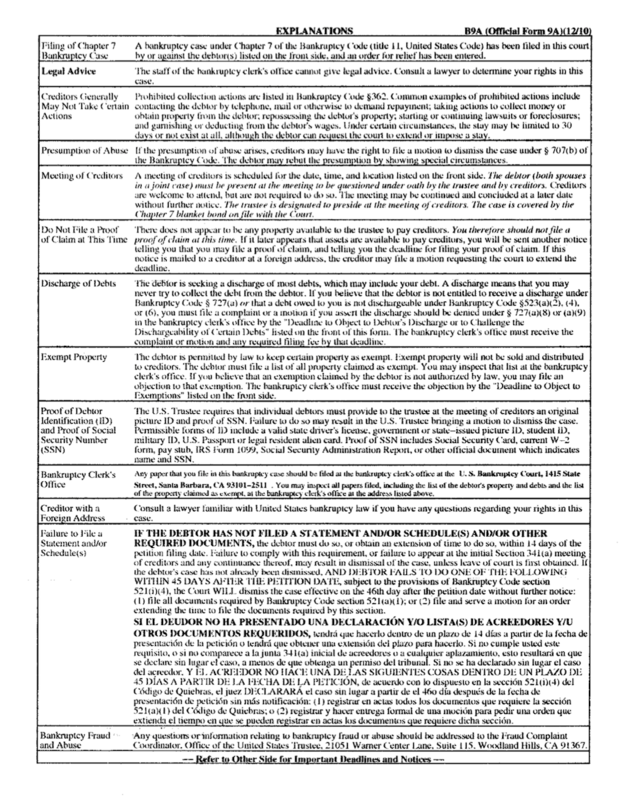 You further warrant that you have the legal right to submit such communications and that you accept full liability and responsibility for their entire content and for all and any consequences arising from such citation, republishing or reuse. This overrides, supersedes and takes absolute precedence over any other copyright or confidentiality clauses unless explicitly agreed by both parties in advance. In particular, these terms will be invoked in the event of a perceived threat to this site such as but not limited to attempts to serve Cease and Desist notices.